A native of Malaysia, Yeohlee Teng (1955-) came to the United States to study at the Parsons School of Design in New York City. 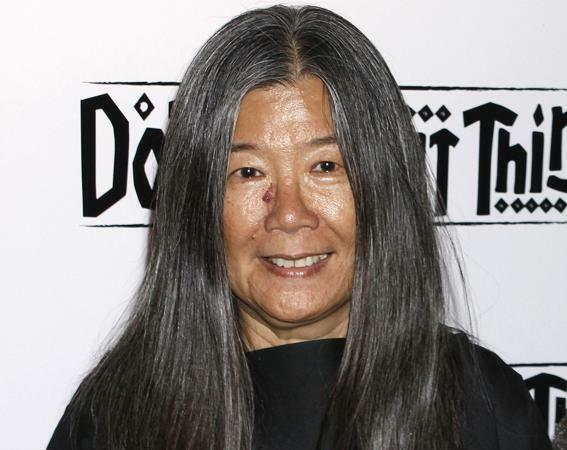 She worked in New York since her graduation from Parsons, and opened her own house, Yeohlee Inc., in 1981. Yeohlee's strong and consistent approach to clothing design has made her name synonymous with efficiency, striking geometrical designs, and concise functionalism. All of her clothing patterns have incorporated the principle of maximum utilization of fabric. Her signature garment was a one-size-fits-all hooded cape cut from a single 3.25-yard piece of 60-inch fabric, using all of the material with no waste whatsoever. This unique cape brought her widespread attention when it was included in her first collection in 1981, and it has been in every one of her collections since then. Yeohlee also pioneered the use of high-tech fabrics and surface treatments to produce wrinkle-and stain-resistant clothes that are easy to care for and easy to pack. She worked with a palette of colors that emphasized black, white, and earth tones, though her collections were also often accented with striking shades of green, red, and orange. Yeohlee designed for the urban nomad, a postmodern customer who demanded adaptable, functional, low-maintenance clothing that looked appropriate and made a powerful impression in a wide range of situations. The designer was associated with the phrases "clothing as shelter" and "intimate architecture." The output of Yeohlee Inc. was aimed at a relatively small and loyal customer base rather than at the mass market; the company sold through a limited number of department stores and specialty shops in the early 2000s. Yeohlee's designs tended to be relatively uninfluenced by seasonal and annual fashion trends, but rather followed the evolution of her own design vision. Her clothes appealed to the sophisticated, design-conscious clientele of the early 2000s. Yeohlee's work, often described as "architectural," attracted the attention of critics and professionals in other fields of design. To an extent unusual for fashion designers, her clothes were exhibited as design art in many museums and galleries in the 1990s and early 2000s. Her participation in the group show Intimate Architecture: Contemporary Clothing Design, presented at the Hayden Gallery at the Massachusetts Institute of Technology in 1982, won a great deal of favorable attention for her work and was an important factor in the early success of her company. Her clothes were also featured in solo shows at the Aedes East Gallery, Berlin; P.S. 1, New York City; the Netherlands Architecture Institute, Rotterdam; the London College of Fashion in association with the Victoria and Albert Museum, London; and the Museum at the Fashion Institute of Technology, New York, as well as in a number of other group shows. Her work was also placed in the permanent collections of the Costume Institute of the Metropolitan Museum of Art, the Museum at the Fashion Institute of Technology, and other major fashion museums worldwide. In the words of the late fashion historian Richard Harrison Martin, Yeohlee "is one of the few practitioners of her art who has fully eschewed fashion hyperbole to engage in a critical discourse about clothing in space [and] on the body." See also Fashion Museums and Collections; High-Tech Fashion; Performance Finishes; Techno-Textiles. Major, John S., and Yeohlee Teng, eds. Yeohlee: Work-Material Architecture. Mulgrave (Victoria), Australia: Peleus Press, 2003. Steele, Valerie, and John S. Major. China Chic: East Meets West. New Haven, Conn., and London: Yale University Press, 1999.